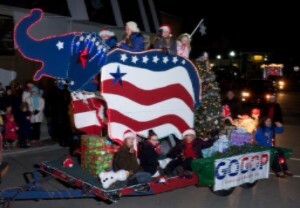 Fun for you & the kids, ride along on the GO-GOP Lighted Christmas Elephant float, Sat. Dec. 1st! Orion parade starts at 6pm... and riders should be at the starting point and on the float by 5:00 pm... at Blanche Sims Elementary School, 465 E. Jackson, Lake Orion. Please RSVP by Email to (rsporter@ameritech.net) advising how many riders you'll have. Note, you're also welcome to walk along with many other friends & supporters handing out treats to the little folks. The GO-GOP Club provides this newsletter as our main source of communication to our members and interested parties. To keep it current and newsworthy, we invite submissions about relevant events. Please follow our editorial guidelines when submitting your information. Please send submission requests to Ross Ensign at least two weeks before the next scheduled meeting (usually the first Tuesday of the month) to ensure it meets our deadline. Thank you!